Transcranial Magnetic Stimulation (TMS) is a non-invasive treatment for Major Depression cleared for use by the FDA in October 2008. 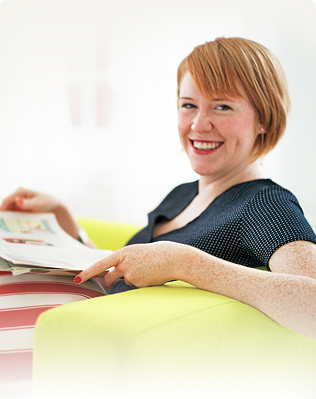 TMS has been researched for decades and is now clinically available. Given in an office setting without anesthesia, treatments last about 30 minutes and are typically given 5 days a week for four to six weeks. Magnetic pulses, generated by a treatment coil, are used to stimulate specific mood centers of the brain. TMS is the only non-invasive form of magnetic brain stimulation therapy available today. However, brain stimulation as a treatment for depression is hardly new. Electroconvulsive Therapy (ECT) is an effective form of brain stimulation that has been used for decades and is still in use today. It is usually done in an inpatient hospital setting and requires general anesthesia. ECT uses an electrical current to trigger a generalized seizure in the brain, this causes firing of neurons throughout the brain but can have significant side effects such as memory loss. In recent years, the FDA has cleared the use of Vagal Nerve Stimulation (VNS) as another treatment for depression. In VNS, a pace-maker like battery pack is implanted in the chest and an electrode is attached to the Vagus nerve which runs down the center of the body. The nerve, which goes to the brain, is regularly stimulated by the electrode. This depression treatment seems to help about 30% of patients with refractory depression. Deep Brain Stimulation (DBS) is another type of stimulation therapy using a battery pack and electrodes. In DBS the electrodes are surgically placed directly into or on the brain. This has been shown to be an effective treatment for several conditions such as Parkinson’s disease and Obsessive Compulsive Disorder (OCD) and is currently in clinical trials for use in depression. 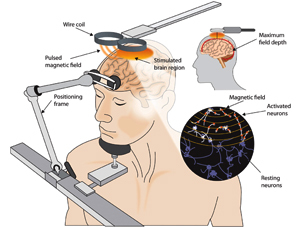 With TMS, electrical currents are induced in brain cells in a very specific region using pulsed magnetic fields. 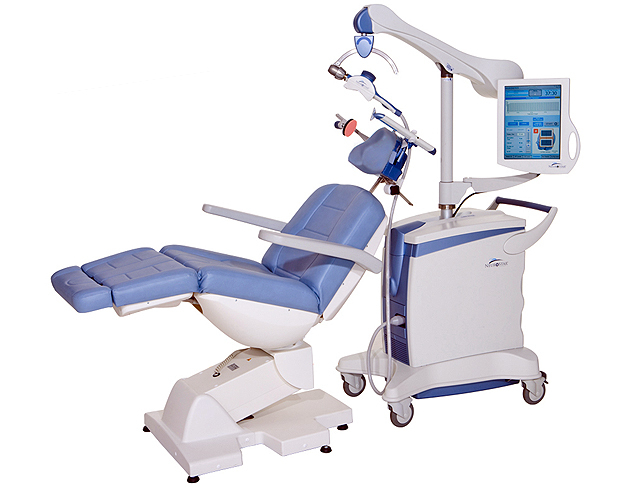 The TMS machine uses a strong electrical pulse in the treatment coil to create a magnetic pulse that travels across the hair, scalp, and skull, to induce electrical currents in the nerve cells of the brain. Directed at a very specific area of the brain, the pre-frontal cortex, these currents are strong enough to stimulate brain activity but mild enough so as not to induce a seizure. For FDA clearance, TMS was studied in patients who had failed at least one adequate trial of an antidepressant medication. In this population, in an open clinical trial, about half the patients showed good response to the treatments with about a third of patients feeling completely better. TMS has been cleared for use by the FDA as a treatment for Major Depression. TMS is now being studied for use in other conditions as well.